That certainly looks like Death's Head, to me. Death's Head, losing his... er, head. But clearly having a spare, yes? In all likelihood I know that's probably little more than a cameo. But yes, I will bill buying purely on the off-chance. Marvel is pleased to present your first look at Avenging Spider-Man #17 from the red-hot creative team of Chris Yost & Paco Medina! The Superior Spider-Man is forced to work with the FF as the literal future comes crashing in on them, threating to destroy the Foundation itself and expose Spider-Man’s ultimate secret! 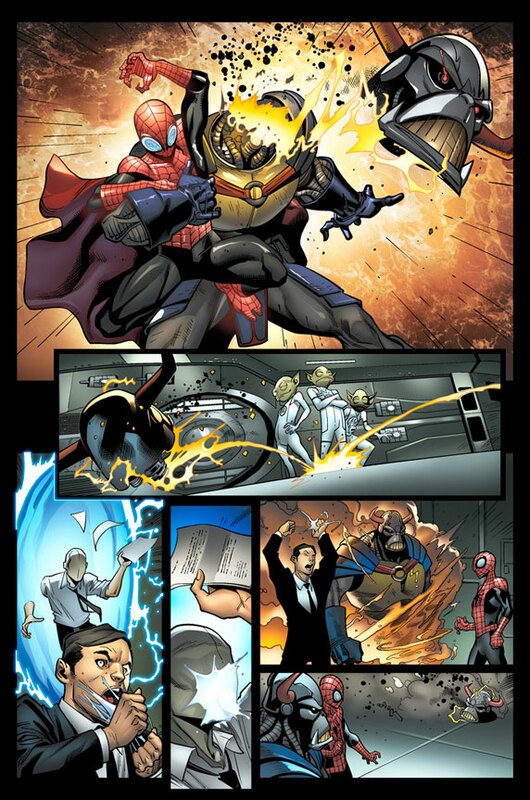 Can Spider-Man play nice with the kids of the Future Foundation while keeping the future at bay? Find out this February in Avenging Spider-Man #17! Yost is a great writer, and I always enjoyed Medina's art on New X-Men. My interest is piqued. Another Marvel UK appearance also seems to be on the horizon for Captain Britain. Secret Avengers is being rebooted, and he's off that (Given the characterisation, probably for the best), but a couple of people have been bothering Tom Brevoort over at his Formspring page over where Brian Braddock may be turning up next. Prompting the following responses. So there you have it. Avengers Assemble #14. No images yet, or any real information. But I'll find some and post it when it's out. I'll keep an eye out for the Captain Britain appearance in the Avengers Assemble issue or issues? Probably a single issue, but we live in hope of more. Glad to see Remender's Portrayal of Cap hasn't ruined his appeal too much, that he is still in the thoughts of Marvel. Indeed ElvenBrit. I'm glad that he's not being forgotten. I've always felt Brian to have been a logical addition to The Avengers. A shame it wasn't for the main team, however. @uggabugg - Interesting. I have that issue on my stack. Not got to reading it, yet. Will have to cast a look over it today. The Death's Head Squadron of mainstream Marvel (Headed by Von Strucker) we the real Squadron from Nazi Germany. But ultimate HYDRA is as US based terrorist organisation, to date. I'll check it out. Of course it was a Von Strucker that ended up as Charnel in both Death's Head II and What If...Death's Head I had lived. The great thing about Death's Head, and Marvel Timelines often being considered to become seperate alternate universes in their own right, means that while we all saw how Death's Head *became* Death's Head II it's still perfectly plausible for the version for What If...? to co-exist with the other, and (should it wish) stray back into current continuity. Blogger. Writer. Comics Fan. Creative Type. ...in October of 1976, on the moors around a research facility. For a few years thereafter it lurked in the shadows, doing its own thing, telling its own tales, until suddenly it found that it was a bit a successful. It began to grow, create more of itself, embrace licensing and raise its profile higher, until the day came when it's older Brother had to take notice of it. This is a blog dedicated to the mostly forgotten (But ultimately worthwhile) British corner of the Marvel Universe. Its titles, its characters, its former imprint and more recent revivals. God knows they all seem to gnaw away at my brain so often that, since 2007, I thought that I may as well find a way to exorcise them in a constructive fashion. This site was the result. So welcome, friend. If you loved Captain Britain, or if you remember Death's Head, or even if you're just curious about what the hell Marvel UK had to offer back in the day, then pull up a pew, embrace the nostalgia, and pray that there may yet be some kind of future for these Properties, Characters and Places. Contrary to some people's beliefs they were mostly written in-continuity with the American Marvel Comics. You may not see them as often as the likes of Iron Man, Spider-man or Captain America, but they are still out there. The Death's Head which Almost Was - an interview with David Leach. Death's Head and High Noon Tex. Issue-by-Issue: The Knights of Pendragon, Volume One - A Prologue. Revolutionary War: Knights of Pendragon Preview. What's the deal between Marvel and Panini, now? Captain Britain's 40th Anniversary (Hopefully) on Marvel's Radar.